Blood pudding is a rich, dark sausage made of pig's blood, pork fat, onion, oatmeal and spices. Popular in Britain there are equally rich, dark variations in France (boudin noir), Spain (morcilla) and many other countries around the world. Crumbling the black pudding makes it less intimidating for the non-converted, as with this breakfast recipe. 1. Finely chop the black pudding and cook in a dry nonstick frying pan over medium heat. Mash it into crumbs with a fork as it softens and then fry until it just starts to crisp (1 to 2 minutes). Set aside and keep warm. 2. Whisk the eggs with milk, sea salt and pepper. 3. Heat the butter in a nonstick pan, add the eggs, and cook over medium heat. Don't stir, just slowly push the eggs around the pan in a broad sweep with a wooden paddle until just cooked, soft and curdy (1 to 2 minutes). 4. Pile the eggs onto hot buttered toast. 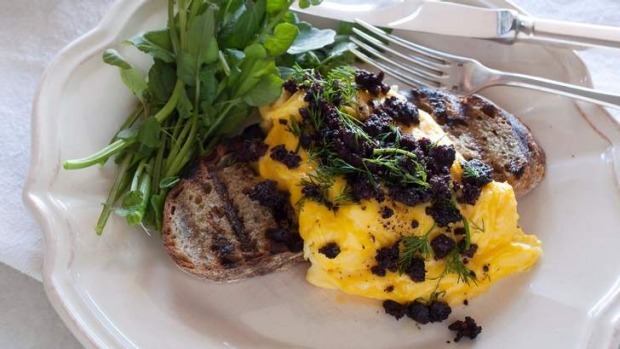 Toss the black pudding with dill and scatter on top. Serve with cress or rocket.